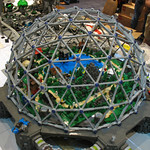 I built a large LEGO geodesic dome in 2006. Geodesic domes are awesome. They were invented by Buckminster Fuller, who was also awesome and could probably disintegrate Chuck Norris just with his brain. They house your corporate sponsored educational-funtime rides at Epcot and protect the last forests of earth, floating free in space. In the future, the futuristic skin of geodesic domes will be the only thing that comes between the computer-controlled utopia you call home and the irradiated wastelands beyond. They're nice on the moon too. It was a great LEGO model to make; it could be packed down relatively well, transported and set up at a show without too much trouble.